Synonyms: Pocket Monsters: Best Wishes Season 2 - Decolora Adventure Da! After their encounter with Team Plasma, Satoshi, Iris and Dent start a new journey in the Decolora Islands. Side story: Pokemon Best Wishes! Season 2: Decolora Adventure - Dent to Takeshi! Gyarados no Gekirin! 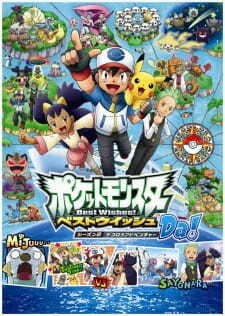 !, Pokemon Best Wishes! Season 2: Decolora Adventure - Iris vs. Ibuki! Dragon Master e no Michi!! First of all, I'm been watching this show since the first season that began in 1998 when it first aired on TV (the English version). I'm watching in Japanese from near the end of the Diamond and Pearl to now. The story is the usual common story-line, Ash and his two friends, Iris, and Dent, goes on on a boat adventure for most of the time and seeing the characters from previous seasons like Professor Oak and Clair. During the 2nd half of the show, a character from the Kalos region arrives and the story continues there. Even though, the Decolora adventure is giving hints for the X and Y series that is coming next month; however, the episodes feels lacking and a bit predictable for most of the time. The art is the same as it usual is in the black and white series. Overall, its nice and simple with a bit of 3D animation and its not bad for a long anime show. The sound is good as it always is in this show, even the music is good. Even though it does get repetitive by just listening to the soundtrack. The sound of the pokemon and their moves is usual as always. The voice actors did a great job with the roles. Well, he's still the same as always since the beginning of his first journey. Not much with his character development, just traveling with his friends and Team Rocket getting in the way for the entire boat adventure and now Kalos too. Not so much character development for Iris and Dent. Well, not as enjoyable like the previous seasons since the plot is getting a bit boring and uninteresting since this series is to make more time for the X and Y series. It can't be helped, either they can rerun a few of previous episodes which they never did or make new episodes that drag out till the next season starts since it is for the kids who are starting to watch this show. This show has continued for a while and the creators are starting to run out of ideas. Hope the next season will be better than black and white since its not interesting as the diamond and pearl series. Also this series is common with going on a journey, getting badges, meeting new people and battling just like the games. For the Decolora adventure, it is recommend for people who likes Pokemon and can handle the sort of same events in every episode since the beginning of this show. This is not the last season maybe the next one will be the last one because of lack of plot and ideas of black and white series. Ash is still the same age as he always been except for the one episode in the first season with the journey for a year. Well, hope this review is ok, since I'll probably go on a rant if I continue. Well, I ended Episode N with my only hope being that this last Unova arc wouldn't be a total waste of time... Was it? Eh... Kind of. It follows the end of the Pokémon formula. After Ash participates in the region's Pokémon League, he always returns home, albeit briefly, before becoming acquainted with a new region in some way or other and then setting off on another adventure. Was this season terrible? No. But did that last step of the journey really need to be stretched out to last 20 episodes? Also no. It's like this... Each season is always a collection of mini adventure plots with the occasional important bigger plot episode thrown in. This last season of Best Wishes was kind of like the mini episodes without a bigger story to tie them together. There were pieces of it that I liked. Alexa's inclusion felt tasteful. It was nice for Ash to get to spend some time appreciating the new Kalos Pokémon before he decided to rush off and catch some himself. Usually, all we get is Ash's mother mentioning a new region he's never heard of and then he's off. Especially because the ending of this formula is usually a little rushed, I kind of enjoyed not seeing Ash's journey home and plans for the future crammed into a single episode. (Though it is worth noting that his decisions being very last minute is totally in character for Ash.) So I would have liked seeing it spread out a little... Just not quite as much as it was. And then the conclusion of his travels with Iris and Cilan were rushed anyway. I didn't think they would be at first. Three episodes out from the end, we get to meet back up with Cilan's brothers who've come up against a challenger threatening to take their gym if she succeeds in defeating all three of them. Cilan manages to come out on top, using some of the things he's learned over the course of his travels, but this does leave him worried for the sake of his gym. And though it's been done before, I was totally expecting him to cut his travels short and return with his brothers to Striaton, and I would have been totally okay with that. I think that would have been the end of a good character arc for Cilan, and he could always set back out on another journey in the future after affirming that everything was all right at home. But he doesn't... His brothers assure him that they can handle the gym (despite all evidence to the contrary) and send him on his way. It was just a little strange to me, because the writers had such a fitting, heartfelt place to leave Cilan... And they didn't take it. Though he does depart the very next episode, on a note that doesn't feel nearly as well-thought out... And we get even less for Iris. Basically, she just meets up with the Dragon gym leader from Johto over the course of their travels and decides to go challenge her. It's just... they were both so excited about getting to Kanto, and then they're both only there for, like, a day before they go rushing off on their own adventures elsewhere. It just felt very... perfunctory. Like, the writers knew they had to get rid of Iris and Cilan somehow, they just didn't have a good way to do it. And honestly, they didn't even look that sad to be going their own ways. It all just felt a little lukewarm to me. But whatever. I've been excited to get out of Unova for a while. So I guess I wasn't terribly sad to see them go either. Pokemon has always featured Satoshi (Ash) challenging Gyms to win badges and enter the Pokemon League. But Gym battles are not the only path open to a Pokemon trainer. Aspiring, young trainers can also work hard to win Showcases, Contests, and a number of other events with their Pokemon partners.